The Kitchen and Dining festival you’ve been waiting for! Its time for the Mega Kitchen and Dining Festival! We bring to you a large variety of cookware from colorful crockery sets , to designer cutlery and even tupperware products. There are also large appliances like refrigerators, microwaves and tandoors to set up a lavish look for your kitchen . We also have other small appliances like blenders and choppers, mixers and grinders , juicers and toasters which are a necessity for everyday kitchen use. Looking to set up a new kitchen or replace an old appliance? What’s better than buying the best brands from our Mega Kitchen and Dining Festival. Looking to revamp the look of your kitchen? we have colorful and bright kitchen linen sets to help you get in the mood to make some wonderful dishes . 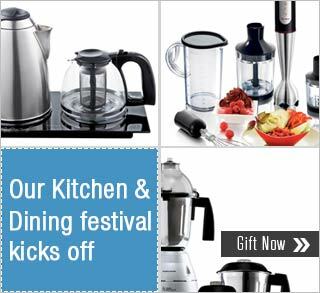 So Hurry and avail of our our Mega Kitchen and Dining Festival!